As an LLC member, you might be wondering if the law allows you to expel another member. Yes, Florida law allows for the expulsion of an LLC member in limited cases. There are certain circumstances that must apply pursuant to the Florida Revised Limited Liability Company Act, known as the “Revised Act.” Outside the circumstances set forth in the Revised Act , a well-drafted LLC operating agreement can also provide options for expelling a member. When the LLC operating agreement provides for expulsion as a remedy for a member’s misconduct, this often will be the simplest form of removal. This is why it’s important to have an operating agreement for your LLC. The member is another entity that has been dissolved. The member was engaged in conduct that relates to the LLC’s affairs and activities that makes it not practicable to keep the person on as an LLC member. 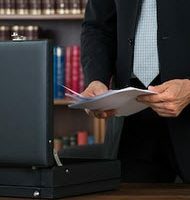 If you want to initiate expulsion proceedings against an LLC member, whether it’s enforcing a provision of the LLC’s operating agreement or a remedy under the Revised Act, the LLC member-dispute lawyers at McCabe Rabin, P.A. can assist you. Our lawyers are specialists in complex business litigation, including LLC breakups and other business “divorces”. Contact our West Palm Beach office at 561-659-7878 today to schedule a consultation.